Adaptation of the story of Cinderella. Ella (Caron), nicknamed Cinderella for her filthy appearance, is lonely and rebellious. She is the servant to her stepmother (Lanchester) and two stepsisters (Blake, Daniels), who are in a tizzy over the return of Prince Charles (Wilding) and are preparing for his ball. While sitting by her favorite secret spot by the river, Ella meets dizzy Mrs. Toquet, who everyone says is crazy. Ella also meets the prince by the river but doesn’t know he’s royalty. Mrs. Toquet helps Ella get ready for the ball without magic but through creative means. -According to TCM host Robert Osborne, Michael Wilding was cast to keep his wife-MGM contract player Elizabeth Taylor-happy because Michael kept complaining that he wasn’t being given any roles. -Leslie Caron wrote in her memoir “Thank Heaven,” Michael Wilding was so unhappy in his role as the prince that he begged Caron to throw a tantrum and say that she wanted a new co-star. She didn’t feel like she could make such demands. However, Caron said she and Wilding got along and she was always in awe of Elizabeth Taylor’s beauty, who was married to Wilding at the time. -Michael Wilding was dubbed by Gilbert Russell. -Dancers Tommy Rall, Jacques d’Amboise and James Mitchell were considered for the role of Prince Charming. This film was more about ballet numbers rather than songs. “The Glass Slipper” is a glittering, charming and enchanting take on the classic story of Cinderella. 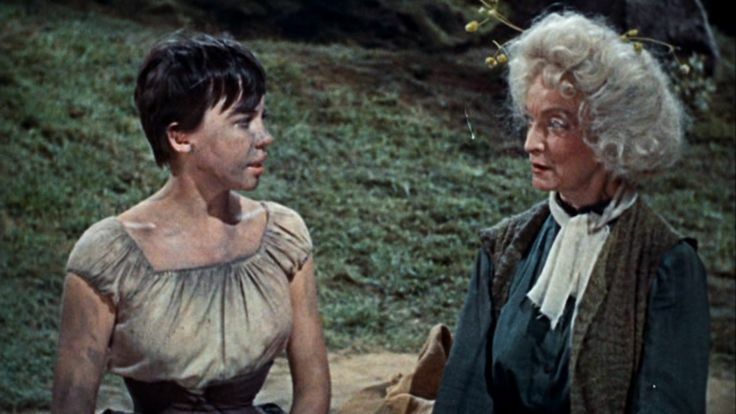 Set against a colorful, storybook land, the film has a remarkable supporting cast that includes Keenan Wynn, Elsa Lanchester and Amanda Blake. “The Glass Slipper” isn’t your typical song and dance musical. 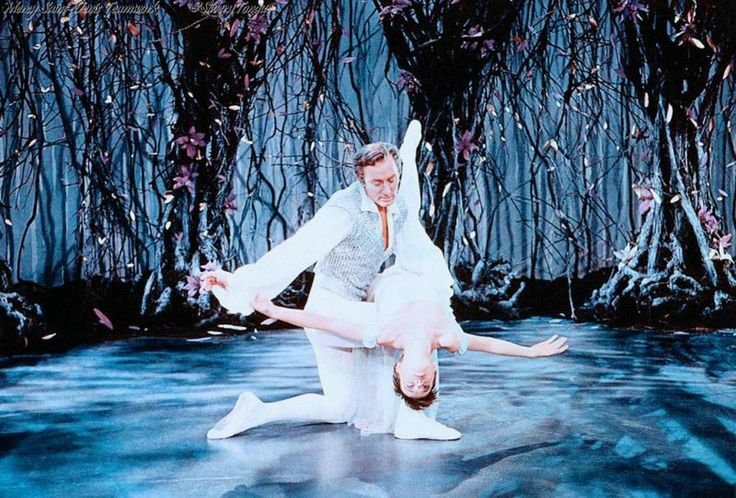 There is only one song that is performed by a dubbed Michael Wilding, but the other numbers are beautiful ballet numbers daydreamed by Cinderella. There are three major ballet numbers in the film, exhibiting Caron’s lovely talent. I enjoyed watching her precise and perfect ballet steps, because I love dance and dancing. However, I can see how this could be dull for someone that isn’t interested in ballet. 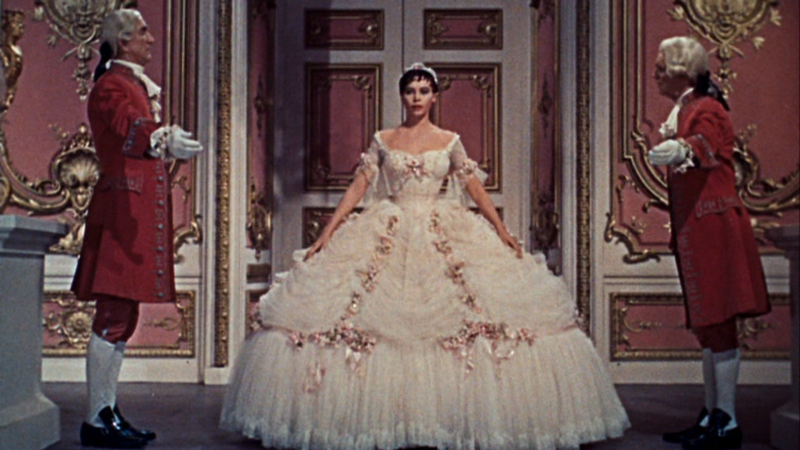 Leslie Caron’s version of “Ella,” or Cinderella, is different than the sweet, sad character we are used to from the Rogers and Hammerstein musicals or the 1950 Walt Disney cartoon. Caron’s Ella is a bit of a tomboy and exhibits her loneliness and sadness through rebellion, talking back and scoffing at anyone who is rude to her. Her fairy godmother is different from the traditional godmother who makes the evening happen with a magic wand. Played by Lurene Tuttle, rather than using magic, she steals…or borrows. She gathers the gown and glass slippers which she will return and makes a bargain with a driver of a carriage who has to take Cinderella home by 12 a.m. because his group is heading home at 1 a.m.
As for Ella’s stepfamily, rather than being evil, they are just lazy social climbers. Elsa Lanchester in her role as the evil stepmother is particularly hilarious. But the person that makes the whole movie and that steals the show isn’t even shown on screen! I LOVE Walter Pidgeon as the narrator. He has the perfect delivery and warm tone to tell a fairy tale, but he is also hilarious! I laughed out loud many times at his dialogue. The only downside of the film is Michael Wilding as the prince. He’s not bad but I feel sorry for him because he looks so uncomfortable. He’s in two of the dance numbers, and it’s obvious the choreographer worked to add Wilding into the dances without really doing anything. For example, Wilding stirs a pot in one number or stands while Caron dances around him. He looks so uncomfortable. Had a dancer such as James Mitchell or Tommy Rall been cast, it would have been appropriate, but studio politics cast Wilding instead. Acting wise, Wilding is fine. 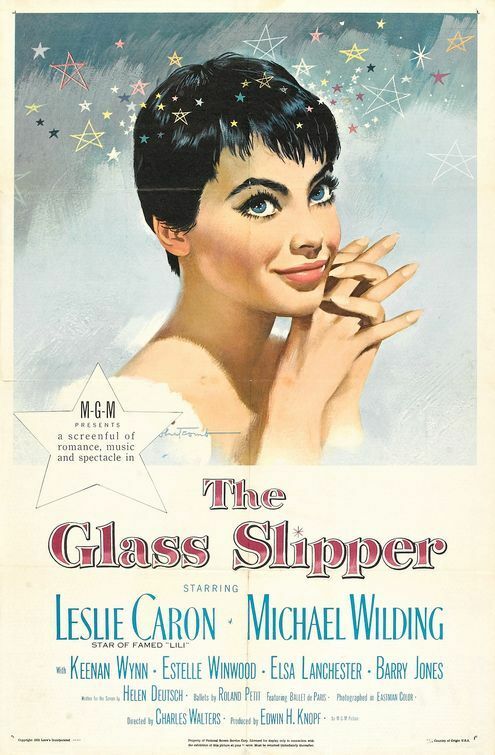 “The Glass Slipper” is a lovely, magical film. When I originally saw this movie more than 10 years ago, I wasn’t enthralled. I’m glad I visited it again, because it found me enchanted.